The following is an interview of Sifu Cheng Chiu. 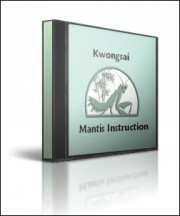 He is the son of the late Chu Gar Mantis Grandmaster Cheng Wan. Accompanied by Dr. Ang Choon Jek, Hakka Chinese from Australia, I visited Cheng Sifu to make inquiries into his efforts propagating Chu Gar Mantis. CKC: Well, the son, Lao Hong, will be in his 90s, but I don't know how to find him today. I have not heard of his passing and so he is possibly still alive. RDH: Your father, Cheng Wan, was my second Chu Gar teacher. I called him Sigong but he asked that I should call him Sifu since I had made ceremony with him. He once asked me to drive him to Lao Sui's ancestral home since I live only 20 minutes away. He kept in touch with them and had gone there several times of which I know. Have you ever been to Lao Sui's home in Huidong? CKC: First, I see you are my father's disciple in his own handwriting on this paper, so we are brothers - I am your "si-hing". I know that the old Hakka there in Huidong used to call our Art "Chu Gar Gao" including Lao Sui. But, I have never visited them there. RDH: Chu Kwong Hua was recognized as the successor to Lao Sui by the Hong Kong community at the time of succession. Does Chu Kwong Hua have any relatives alive today? 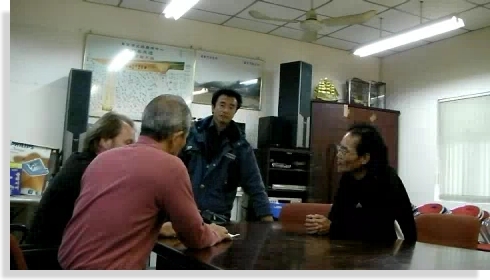 CKC: He has a son, Chu Chi Keung, who is still around I believe. He operates a medical clinic but does not teach Chu Gar. RDH: The late Dong Yat Long was my grandteacher. His disciple, the late Chen Ching Hong, was my first Chu Gar Sifu by ceremony. Are any of his family still alive? 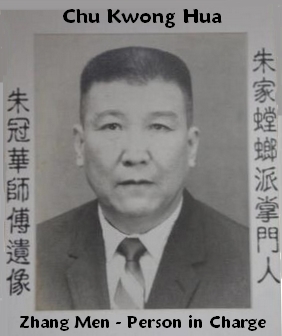 CKC: Dong Yat Long had three sons and a younger brother. 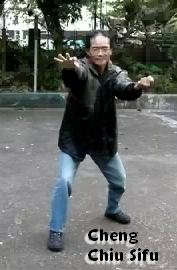 The son, Dong Wai Ting, used to teach Chu Gar but I have lost contact with him for a long time. Dong Fook Hong, the brother was also a Chu Gar master. He has only one eye and if he is still alive he should be very old. RDH: You teach Chu Gar boxing and Unicorn Dance, correct? CKC: Yes, I teach four Chu Gar forms, tsai Kiu, dui jong and such, but not much these days because the students prefer to learn the Unicorn. So, I teach Unicorn once a week and some student's also train the Chu Gar. RDH: Do you teach exactly as your father, Cheng Wan, did? CKC: No, I teach the original four forms but, as you know, my father also taught a fifth form, "Wu Tanglang Xia Shan Fu" - "Five Mantids Descend the Mountain". It is a fighting form that covers the four corners using lop shu grabbing and gow choy hammer fist. It has been demonstrated many times even on Hong Kong television and for a time was the standard for public demonstration. RDH: How many others of your father's students are teaching Chu Gar Mantis today? CKC: Wu Yin Fat, a student of my father, Cheng Wan, is teaching in USA. There is another in Holland. These students are very old students. But, none other of our 'Chu Gar Pai' are teaching here in Hong Kong now. RDH: How long do you take to teach your students the system? CKC: It depends on the students - some are slow and some are fast - their interest and ability. One needs at least six months to learn the four fundamental forms. RDH: Did you only learn from your father or did you have other teachers as well? CKC: I started at age 15 and have only ever learned from my father, Cheng Wan. RDH: What are the important factors to build a firm rooted stance? CKC: Walking the horse, freestyle circle stepping, tsai kui (four corners grinding arms) and dui jong (two man resistance training). RDH: What "hands" and supplemental techniques do you teach? CKC: There are 36 hands and each has 3 techniques or variations. 36 x 3 =108. 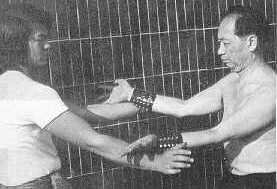 An example is gow choy hammer fist - there is the top, inside and outside hammer fist which is three variations. RDH: One should train soft and relaxed. Chu Gar should be half soft and half hard. But, most I see today train very hard and tense only. What is your teaching about this? CKC: One should be soft and relaxed until the moment of impact when it becomes hard. We call it "Ging Tan Lik" or something like "frightening spring power". 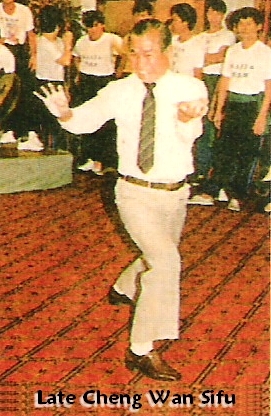 RDH: Do you teach qigong? RDH: Do you teach "shen gong" or "spirit work"? CKC: I have learned Mao Shan Shen Gong but I do not teach that. RDH: What are the important attributes in learning unicorn dance? CKC: The Unicorn is not difficult to learn but very hard work. Unicorn Dance stepping is a low horse while Chu Gar martial arts is high horse. RDH: How long does it take to learn the basics of the unicorn dance? promoting Lao Sui's Chu Gar. RDH: Yes, Yip Sui Sigong did a great work in spreading Chu / Chow Gar! *Special thanks Brother Cheng Chiu and to Dr. Ang for these questions and his effort filming. Copyright © 2012, Roger D. Hagood. All Rights Reserved Worldwide.